Submitted by kathyf on May 26, 2015 – 4:26pm. I decided to change up my regular almost no-knead bread. I replaced about 26% of the bread flour with white whole wheat and added a tablespoon of wheat germ. I think I prefer it this way. I like the texture the whole wheat adds. 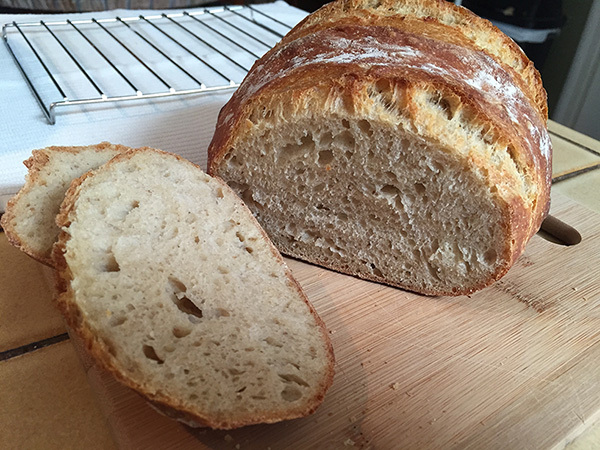 I think it is time to move on to a new recipe for my sourdough bread. I am considering either going with the 1-2-3 recipe or the Norwich Sourdough recipe from Wild Yeast blog.